Ukuele Magazine has posted an article that excerpts a bit of John King and Jim Tranquada’s book, The Ukulele: A History. 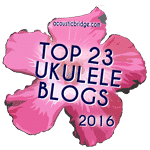 I’m about halfway through that book and am loving it – a must read for any ukulele lover. The level of detail and story telling is astonishing and results in a highly readable, but academic-grade history. If you don’t have the book, this article gives you a nice taste.